*Conditions apply: Prices are cruise only per person in AUD in complete twin accommodation, inclusive of all discounts, taxes, government fees & charges (which are subject to change), based on lead category for each stateroom type. ^Offer ends 30 Apr 19, unless sold out prior. Princess Cruises has set aside a reasonable number of staterooms which are available at these fares. Once these staterooms are sold, fares may revert to a higher fare, but may also be discounted. Valid for new bookings & not combinable with any other offer. Onboard spending money is per stateroom as marked on selected itineraries as speciﬁed & is applied to the ﬁrst 2 passengers in a stateroom. Onboard spending money is based on the ship’s onboard currency, is not transferable, non-refundable, not redeemable for cash & cannot be used at the medical centre or casino. Advertised onboard spending money of up to $300 applies to Balcony & above staterooms that have been booked on select voyages sailing for 15 - 21 nights. Cruises between 7 – 14 nights duration receive up to $200 onboard spending money. Ask for full details. Onboard spending money will expire if not used by 10:00 PM on the last evening of the cruise. Some oceanview staterooms have obstructed views. To be read in conjunction with Princess Cruises Booking & Passage Conditions which passengers will be bound by. #Port transfer / pre-cruise accommodation discount offer is exclusive to eligible Princess Cruises bookings made with Ucango Travel & Cruise Centre by 30 Apr 19, unless sold out prior. Available for new bookings only & when ﬂights & cruise are booked with Ucango Travel & Cruise Centre. One transfer from airport to port per each passenger. Pre-cruise accommodation up to a value $300 available when total booking value is over $15,000. This can be used to subsidise a higher grade hotel. Guests can choose between transfers or pre-cruise accommodation when total booking value is over $15,000. Please ask for full details. Booking, credit card & cancellation fees may apply. Further conditions may apply. ATAS No. A10644. PUBLISHER Michelle Austin 5493 1368. 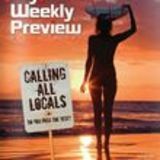 EDITOR Dorothy Whittington, editor@yourtimemagazine.com.au ADVERTISING ENQUIRIES 0438 717 210 or 0413 855 855. sales@yourtimemagazine.com.au. FOR DIGITAL EDITIONS AND MORE yourtimemagazine.com.au. 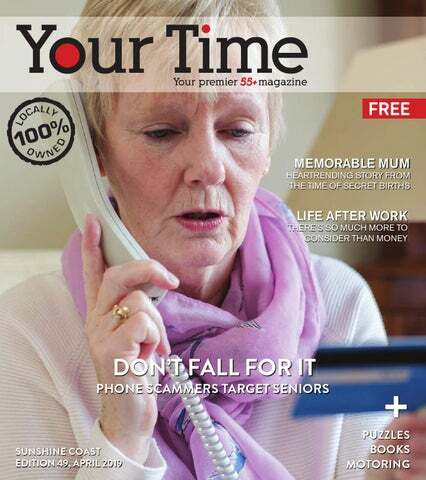 DISTRIBUTION ENQUIRIES distribution@yourtimemagazine.com.au. Your Time Magazine is locally owned and published by The Publishing Media Company Pty Ltd ATF The Media Trust (“the Publisher”). No part of this publication may be reproduced or copied in any form by any means without the prior written consent of the Publisher. The Publisher does not assume responsibility for, endorse or adopt the content of any advertisements published in Your Time Magazine, either as written copy or inserts, given such content is provided by third parties and contains statements beyond the Publisher’s personal knowledge. The information contained in Your Time Magazine is intended as a guide only and does not represent the view or opinion of the Publisher or its editorial staff. Professional advice should be sought before applying any of the information to particular circumstances. Whilst every reasonable care is taken in the preparation of Your Time Magazine, the Publisher and its editorial staff do not accept liability for any errors or omissions it may contain. Explore Africa’s iconic destinations - The Serengeti, Ngorongoro Crater, Mt Kilimanjaro, Okavango Delta and Victoria Falls. Encounter extraordinary wildlife, vibrant beauty and cultural diversity. Experience the best of Africa with The Infinite Horizon your Sunshine Coast African Safari Specialist. With over 15 years of expertise Steve and Teena Chumbley will create a tailor-made, all-inclusive itinerary that reflects your personal sense of style and adventure. Enquire now on 0457 249 998 or safari@TheInfiniteHorizon.net for a personalised itinerary. Or join Steve on a 10 day privately guided Tanzanian Safari departing 1st September 2019 (limited places available). Losing your facial definition? CosTATT Clinic’s sole focus is on providing a high quality Cosmetic Tattooing service for its clients through 15 years of international experience in beauty and tattooing procedures. Meet Caloundra’s original manufacturing jeweller Sunstate te Jewellers. You’ll enjoy factory direct shopping, where you never pay y full retail on our beautiful original designs available in our beach side de showroom. You also have the amazing opportunity to talk lk directly to award winning artisans and designers. Hand select g elect your perfect diamond or specialty gemstone and let’s work wo ork together to create jewellery that’s unique to you. There are times in life when everyone needs a little extra support. For many, it’s as they age; for others, support may be needed following medical treatment or when adjusting to a new way of living after injury or other major life event. RangeCare has been supporting people along the range for more than 30 years. And with more than 120 employees and 200 volunteers, we’re here to support you. Mention Your Time for a FREE jewellery clean Visit our atelier and showroom, Monday to Friday 9am–5pm. Offering many years of local, affordable, home computer and network support. Dinner is done! $ 1 x Award Winning Family Meat Pie (1.3kg), 2 x Apple Pies (medium), & 6 x Snack Pies! For more than 40 years, Ian Griffiths and the team at Griffiths Lawyers have provided expertise, results and old fashioned personal service to thousands of individuals, families and businesses across the Sunshine Coast and beyond. We will visit you at your home if you prefer. ANYONE FOR TENNIS? encompassed four key areas: â&#x20AC;˘ AVAILABILITY of service packages: There are long waiting lists for home care packages, people fear being placed in residential facilities and delay seeking help, and there is poor transitioning from home to aged care. â&#x20AC;˘ COMMUNICATION: The MyAgedCare website and phone line is too confusing and technical, especially for people without computer skills. â&#x20AC;˘ MODELS OF CARE AND SUSTAINABILITY: The aged care system should meet peopleâ&#x20AC;&#x2122;s needs. Seniors should not be placed in inappropriate levels of care and facilities eg. non-dementia patients should not be in the dementia ward. â&#x20AC;˘ STAFFING: This includes staff-to-patient ratios, staff qualifications and suitability for the job. $100,000 IS UP FOR GRABS TO SUPPORT EVENTS AND ACTIVITIES Queensland Seniors Week, 17-25 August 2019, provides opportunities to promote positive community attitudes towards older people. Hodgkinson said itâ&#x20AC;&#x2122;s a great time to get out to events and activities. Apply at www. qldseniorsweek.org.au. Sue Johnston, Eric Smith (Chairperson), and Bernie Bill the U3A, Sue in 1998 and Bernie in 2001. The Maroochydore Tennis Club, beside the bowls club at Cotton Tree, has its roots in 1976, when it had two dirt courts and a tiny clubhouse. At the time there was nothing between them and the river, so the courts were built east-towest to avoid the glare from the sun on the water. Many club members are long-term and Narelle Pearce, who joined in 1984, is the longest-serving. Facilities have been consistently expanded and improved since then and Sunshine Coast Regional Council has assured them their lease will remain for sport and recreation for at least another 20 years. A breastscreen is part of life and taking care of yourself Marion, family organiser and busy grandma of seven. #PPLPO 13 20 50PSWJTJU CSFBTUTDSFFORMEHPWBV $BCPPMUVSF Caloundra, Nambour .BSPPDIZEPSF Noosaville. Nambour & District Care has been supporting locals for more than 25 years. Our services provide essential in-home, social and respite support to more than 700 clients so they can maintain their independence for as long as possible. Let us support you. Perhaps you only need a little support, or maybe you require more complex care; whatever your circumstances, we can help. A HAPPY HOME IN THE HINTERLAND Residents at Landsborough Pines for just over a year, Syl and Raye are now a part of the Landsborough Pines community in their brand-new architecturally designed home. Pines park manager at the local markets, Syl and Raye visited the park and eventually moved in. Landsborough Pines provides over 55s an attractive independent retirement lifestyle in a peaceful bushland setting. Residents own their homes and pay a weekly site fee that is subsidised by Commonwealth Rent Assistance for those eligible. The grounds are kept secure and maintained by fulltime on-site management. sometimes share things between us, like plants and food,” Raye says. “They love to come and see the ducks down at the pond,” Raye says. After coming off a big property, Syl and Raye are enjoying having a more manageable home. “We’re nice and comfortable. Our house is the Katherine design and the living area is lovely for two people.” With two young grandchildren only 5 minutes away, Landsborough Pines has a pool and other great facilities for them to enjoy when they come visit. The Katherine is priced from $290,000. Landsborough Pines has a selection of other homes available to buy starting at $119,000 for a one bedroom home. Call for an inspection (07) 5494 1207 | 1 Eudlo Street, LANDSBOROUGH PINES QLD 4550 *Price is based on owning your own home and leasing the land. In some instances, government rent assistance applies. Subject to application, and simultaneously entering into a site agreement. Furniture not included. changed forever. Saltwater people were mixed with desert people. Their culture and language were lost as strict laws forbade them practising their customs. They needed permission to travel into Murgon and generally were not allowed to leave Cherbourg. Lucy was nine when she was placed with a white family to work as a domestic. She was treated so poorly she had to be returned to Cherbourg. She recalled diseases such as chicken pox causing deaths among Aborigines. It raises questions of the deliberate introduction to the community. In the spirit of reconciliation between Aborigines and Europeans many people express their own “sorry” stories. Australia-wide, the stolen generation, the forced removals and the massacres are a terrible blot on our history. While some of us may doubt the sincerity of apologising, it is a step forward. Hopefully, healing and reconciliation occurs where there is an understanding of past wrongs and the harm caused by them. Your choice of location, price option and home design. A welcoming oasis situated just minutes from Maroochydore beach and the Sunshine Plaza. Live in the heart of Buderim surrounded by lush tropical rainforest. Set next to a tranquil lake with resort-style amenities and close to a variety of shops and services. Any capital gain from your home is yours. Feel secure you can change your mind within six months of moving in. Your purchase price is guaranteed back when you decide to leave the village. * Exit Fee refers to the Deferred Management Fee (DMF). Other fees may still apply – see residence contract for full details. If you exercise the 6 month change of mind guarantee, you will only pay fair market rent and service fees. Full terms and conditions of these offers are available from our dedicated sales team. Pricing and availability correct at time of printing but subject to change without notice. Information about services and facilities is correct at time of printing but subject to change. Photographs are for illustrative purposes and may depict items not provided by Lendlease, like furniture. February 2019. Published by Lendlease RL Realty (QLD) Pty Ltd. ABN 25 138 535 814.
oming to Australia, I noticed that habit had not really caught on here. The one with the loudest voice who pushed to the front was served first. In the UK, the standard procedure – if you can call it that – was if you arrived first you stood at the head of the queue. People arriving after would stand in a line behind you, and be served in order. Australia was different. If you entered a shop, and I’m not talking about supermarkets, conversation would begin as soon as you entered. As more customers entered the shop and joined the rousing conversations, there was no worrying about queueing. Everyone seemed to know each other, but as soon as the first person was served, there would be a chorus of requests from the assembled group. The loudest voice appeared to be served first. This occurred when the shop assistant called “who’s next?”. The exception would be the oldest in the group, usually an old lady who everyone seemed to know, and the voice would proclaim an opening to the counter for Mrs Watson. I arrived she came out of the toilets. The queue waiting to get in was still formidable. The reason was that the allocation of male to female cubicles was equal. What is this madness? Women need much more room in a communal toilet block than men? They need more cubicles. Architects need to put a lot more thought into this. These experiences were in the 1960s to the 1990s, so maybe it has changed in the 21st century. From the time, you are born you have to line up. All through school you have to line up. It’s the order of life and I haven’t mentioned the armed forces, where it’s impossible to do anything without lining up. Talking to friends who had lived in the old Soviet Union, “the queue” was the indicator that something important was being sold, like food. You even have to get in line to vote, not that being at the head of the queue makes much difference. So maybe queuing with its rules that everybody knows but don’t talk about, is ingrained, or maybe we just like fairness. Call today to speak with a home care expert and arrange a FREE in-home consultation. poor balance. Her toenails were untrimmed, and her feet were swollen. Alice was at risk of falling. Her doctor booked her in for a monthly podiatry appointment. He modified her drugs and told her to throw out low-fat foods. They arranged for friends and family to drop in and share meals with her. With this new regime, Alice put on a few kilos and continued to live independently. Connecting had sparked her appetite again. Explore the Sunshine Coast’s most vibrant over 55s retirement village at Meridan Plains. Brand new stage 5 designs selling now: 2 bedroom + study + double garage 3 bedroom + study + single garage Attractive, modern and spacious designs for open plan living, perfect for entertaining and socialising with family and friends. set the scene for the club’s enjoyable social outings. There are 750 disadvantaged children in our region and they are the focus of the VIEW Club’s fundraising. VIEW Clubs are an integral part of The Smith Family, a national charity helping young Australians in need to get the most out of their education so they can create better futures for them and their families. The Caloundra Evening VIEW Club is a very welcoming group which holds dinner meetings at 6.15pm on the second Tuesday of each month at the Caloundra Power Boat Club at Golden Beach If you would like to make friends while helping to achieve important social change, phone Sue 0403 504 408 for more information. The Sunshine Statesmen Barbershop Chorus in action at the Adelaide National Convention last year. children’s clothing, pottery, jewellery, knitted goods, jams and spreads and cards, all of them unique. Refreshments will be available in the member-run café and include tea, coffee, home-made cakes and slices and sandwiches. Entry is free, so take a few hours out to enjoy home-made goodies and browse the displays. The group is supported by the Sunshine Coast Regional Council’s grants program. worry about. “The body corporate fees are really manageable, and the peace of mind that everything is looked after for me is fantastic,” she said. Baldwin Living Northside Village Manager Nicole McInnes and her team work hard to create an enjoyable senior living environment for residents. “Our dedication to enhancing independent living for residents is reflected not only in the quality of the facilities themselves, but also in the variety of social, creative and healthy activities offered,” she said. Baldwin Living Northside offers apartment living with all the modern features one would come to expect of ‘resort style living’, and you can enjoy a hassle free lifestyle without the burden of home maintenance. Within the village, there are a blend of one and two-bedroom apartments, each offering a different configuration with quality appliances, modern bathrooms and outdoor entertaining spaces. Baldwin Living Northside is located at 259 Handford Road and is adjacent to 11,000sqm of parkland, with a landscaped waterway, bike and walking paths through to Centro Taigum Shopping Centre. Baldwin Living Northside has properties for sale starting at $230,000 which are open for inspection on Wednesday mornings from 10.00am – Call 1800 911 989 for more information or to arrange an alternate time. For more information visit baldwinliving.com.au. When leaving employment, relative deprivation can combine with relevance deprivation. When leaving employment, relative deprivation may arise in the perception that another man who has just entered the next stage of their life may be doing better than you, that they have “their s--t in order” so to speak: they have a better car, they have just been on a luxury cruise etc. The danger here is that relative deprivation (comparing your internal experience with others in a similar situation) combined with the concept of relevance deprivation (the fact that the phone has stopped ringing and there are not as many invitations has a big effect on your confidence and sense of identity. When leaving fulltime work, many men lose a sense of their identity. They’ve been able to answer the question, “what do you do?” with certainty for so many years and have normally associated themselves with a certain role. The question becomes harder when you’re no longer working. You suddenly have to think about what you are going to say. For many successful men, there is an addictive quality to having relevance within a group or company. This is inherent to many of the patriarchal aspects of the western society. This institutionalisation starts with schooling and continues right through our lives. Our ego needs to be fed and one of the ways to do this is through the creation of imaginary and illusionary temples and templates that support industry and commerce. However, there is a price to pay when tying your identity to your career – the emotional withdrawal that occurs once the status is removed in the movement out of fulltime work and into the next stage. In a business setting and hierarchy, it is easy to measure your success and relevance. When leaving fulltime work, the status and relevance goes … and with that can come feelings of loss and uncertainty. This is why the mental preparation for the shift out of full-time work needs to come well before the shift itself. It is time to be your own man, to be yourself, not a label you’ve worn in a company or business – never mind how many years you’ve worn it. Be free. Steve Mendl is the author of Beyond the Money and specialises in career to retirement transition. Feel good retirement Perfectly positioned on Lake Kawana, Shine is an inspired new retirement community with a focus on your happiness and wellbeing. Here, you have all you need – the healthcare precinct, shopping, cafés, dining and so much more. Plus our world-class Clubhouse and Wellness Centre to enjoy, on site, every day. Four beautiful display apartments – open every day We’d love to show you around our new display apartments and our fantastic facilities. While you’re here, you’ll see the choice of views and explore our beautifully walkable neighbourhood, too. here are many different facets when it comes to preparation for retirement. The challenges are numerous – mentally and physically, psychologically and energetically. These areas are rarely focused on. A survey conducted through the Trans America Center of Retirement Studies in the US revealed that 41 per cent of respondents reported moving out of fulltime work as being more stressful than either the transition into marriage or changing previous jobs. Most indicated that they had not been prepared enough for the reality of having another 35-60 hours a week on their hands. A more recent survey of 1000 new retirees (within five years of retirement) conducted by the Centre for Ageing Better in the UK discovered that 20 per cent of people found the transition difficult. This is particularly the case for successful men. Part of this is due to a crisis of identity. For 60,000+ years, the primary role of men has been to provide for the family and/or the extended social community. As society has developed, we have moved away from hunting and gathering to earning money. In his book David and Goliath, Malcom Gladwell looks closely at Samuel Stouffer’s concept of relative deprivation and how it plays out in various environments. Relative deprivation is the idea that by comparing and evaluating yourself against a cohort or people with whom you spend a lot of time, there is the perception that you are not doing as well as others. Relative deprivation is also called the “Big Fish Little Pond Effect”. In the study explored in the book, Stoufler found that there were similar statistics across many universities, regardless of whether they were prestigious or poorer or less selective public institutions. In a nutshell, it’s not how smart you are, it is how smart you feel relative to other people in your various environments that drives your selfperception. Really, it’s how you feel that matters. In a university situation, the smarter you think your peers are, the dumber you feel. The dumber you feel, the more likely you are to drop out. So how does this idea of relative deprivation relate to the journey out of fulltime work? had enough of centrelink paperwork? CAPA Services can organise and help manage your Age Pension, by providing ongoing administrative support and liaising with Centrelink on your behalf. Our professional staff can take the stress out of the process, while ensuring that your best interests are being represented with integrity and diligence. RETIREMENT: IT’S ABOUT MUCH MORE THAN MONEY THERE’S a lot more to think about in preparation for retirement than how far the super is going to go. The real wealth goes far beyond the dollar, says Steve Mendl who last month launched his book Beyond the Money, a practical guide for successful men leaving fulltime work. Steve talked to thousands of 45 to 60 year-olds about life after work, to formulate the framework he presents in his book that addresses why so many men struggle with the transition. His main message is that there is much more to be considered than the money. “This is not a book about finance, because the focus is always on money. Just google it and you will see it all comes up about super and financial planning,” he says. He lists three main reasons for problems in retirement: • Fear, frustration, confusion and stress –natural emotions natural in times of massive change, but difficult to manage. • Lack of purpose and direction, with some men succumbing to post-work depression. • Loss of identity –who are they now they’ve left the working world? “After 40 to 50 years in the workforce, it can be hard to know yourself,” he says. Steve Mendl at his book launch “You’ve spent all those years going to work to provide for your family and then it just stops. What are you going to do with the extra 40 to 60 hours a week? It can lead to fear, confusion, stress and depression.” Steve says there are more than 12 wealths beyond money and the book addresses seven of them. These include location, relationships, lifestyle and legacy. “Where are you going to live? Do you want to sell up house and move closer to family?” he says. “It’s about time, not money. Don’t fall of the retirement cliff.” Beyond the Money is available now at good bookshops and online. Visit beyondthemoney.com.au Steve will discuss the issues of Beyond the Money in his monthly column in Your Time. See Page 29. If you’re not slowing down just yet, join one of our over 55s FRPPXQLWLHV full of people having as much fun as you are. IRT UHWLUHPHQWYLOODJHV. You’re in good company. Villas now selling on the Sunshine Coast. Visit irt.org.au or call 134 478 to book a tour. From tension headaches to cluster pains, head pain is one of the most common health problems doctors and healthcare professionals treat, writes MELISSA HUI, and more than six million Australians suffer from headaches and migraines. Pack of Epsom Salts when you visit. STEM CELLS FREE TALK NOOSA Come and hear this Leading Expert talk about the only clinically proven product in history that triggers the release of our own stem cells. MARY BARBER This is a fast-paced thriller set in Houston Texas. It’s funny at times, gruesome at others. The main character, Timothy Blake, has a talent for seeing clues other people miss. But he’s a complex man living on the fringes of society. I was reminded of the character Dexter. The writing was tight. (Jack Heath is an Australian writer.) The author uses fresh original descriptions but he doesn’t overdo it. It’s easy to imagine the characters he draws. The story moves along well. This book won’t appeal to everyone but if you like gruesome and bizarre, it’s great entertainment. Providing privacy & independence with the security of proximity to family. Glendale Granny Cabins provide comfortable, self contained accommodation for elderly relatives on the same site as the family home. brilliance in many of the venues. And just maybe, some of these venues have ghosts. ADFAS is a not-for-profit organisation providing superbly illustrated monthly presentations on diverse topics within the arts and related disciplines. Lecturers are recognised specialists in their fields drawn from a variety of professional backgrounds. Drama Theatre, Matthew Flinders College, Stringybark Rd, Buderim. April 8, 6.30pm for 6.45pm start. Call Brian 5445 4439. Visitors cost is $25. Bookings essential. The Jazz and Blues Collective’s next monthly Sunday Jazz N Blues session for the 55+ music lovers, will feature a musical partnership between Norwegian vocalist Vibeke Voller and Israeli Jazz pianist Dan Papiranj. Vibeke’s smooth and dynamic voice combines superbly with Dan’s inspired and imaginative piano playing to delight the audience as they bring a unique warmth and welcoming stage presence. reach for even more impressive levels of perfection. Her recording successes led to frequent appearances on American TV. In 1998 she was honoured by Queen Elizabeth II by being made a Commander of the Order of the British Empire. Enjoy this rare musical treat with the return of a true legend, Petula Clark, at The Events Centre, Caloundra on Sunday 28 April at 2pm. The Downton Abbey team of writer Julian Fellowes, director Michael Engler and actor Elizabeth McGovern come together in the film adaptation of Laura Moriarty’s novel The Chaperone. Norma, played by Elizabeth McGovern, finds her life is changed forever when she chaperones a soon to be famous dancer to New York. Set in the tumultuous early 1920s, one of them is eager to fulfil her destiny and the other hopes to unearth the mysteries of her past. The Chaperone is in cinemas from April 25. They perform an entertaining mix of swing, classic jazz standards, Latin, contemporary and original arrangements. Vibeke and Dan are joined by bass player and guitarist Brendan Scully and drummer Steve Wright. Old Soul Bar, 19 Ocean St, Maroochydore. April 14, doors open 1pm, music 2pm-5pm. Tickets $24, seniors $21. Bookings ticketebo/ jazznbluescollective or call 0417 633 734. PLEASE ASK ABOUT FURTHER SAVINGS ON DEMONSTRATORS! CRICKS HONDA SUNSHINE COAST 88 Sugar Road, Maroochydore | 5450 3300 | crickshondasunshinecoast.com.au *Available on selected new and ex-demo models except those used for commercial purposes, where a 7-year/200,000 kilometre (whichever occurs ﬁrst) warranty is applicable. Honda warranties apply where due care is exercised by the owner and the vehicle is maintained in accordance with the Owner’s Warranty and Service Manual. Vehicles purchased during 13/2/2019-30/4/2019 and delivered before 30/4/2019. Not transferable or exchangeable for cash. Private buyers only. Honda reserves the right to change or extend any offers Please visit honda.com.au/warranty for full terms and conditions, ^Drive away price shown available at Cricks Honda Sunshine Coast, while stocks last on new Honda Jazz VTi Auto in Phoenix Orange. oDrive away price shown available at Cricks Honda Sunshine Coast, while stocks last, on new Honda Civic VTi-S auto in White Orchid. +Drive away price shown available at Cricks Honda Sunshine Coast, while stocks last, on new HR-V VTi-S auto in Passion Red. ≠Drive away price shown available at Cricks Honda Sunshine Coast, while stocks last, on new CR-V VTi-S AWD auto in Silver. ~Please visit cricks.com.au/advantage/for terms and conditions. India-Pakistan border at Wagah in northern India, but obviously of much lesser grandeur. Still, it’s worth watching the pomp, which basically involves trumpet blowing, uniformed guards marching and then almost on sunset, lowering the nation’s flags. Efforts are now being made by both India and Bangladesh to make this a major tourist attraction for both sides. When leaving Tripura, most visitors find it to be one of India’s best-kept secrets and wonder why it’s still an off-the-beat tourist conclave. The destination has a good resume but needs brushing up by the state and national tourism agencies to make it more attractive for travellers. Inclusions • 3 nights Adelaide • 2 nights Victor Harbor • 2 nights Kangaroo Island, Hahndorf • Coorong Discovery Cruise, Cockle Train • Guided tour of Sophie’s Patch (ABC Garden Show Presenter) & so much more. Book now! Sean Lues will be privately guiding this tour in February 2020. Sean has over 20 years of guiding experience in Southern Africa and East Africa. He has a wealth of knowledge and a passion for the African bush and it’s incredible animals. You may have heard Sean talking about Africa on our local Sunshine FM and 4BC in Brisbane. We pride ourselves in providing Bespoke itineraries & guided tours to some of the world’s most beautiful destinations. Inclusions Dubai: City Tour, Dubai Creek River Cruise, Dubai Miracle Gardens, Dune Desert Dinner, visit gold & spice Souks, Jumeirah Beach and much more. Singapore: City Tour, Gardens by the Bay, Orchid Gardens, Sentosa, China Town, free time for shopping. Pictured at an indigenous cultural presentation at the Green House at Beulah Community, Buderim are (L to R) Jadon Briggs (Beulah), Andrew and Jane Parker (Cornwall), Michael Ward (Beulah) and Carol Harman (Sunshine Coast). during her own week-long journeys through Friendship Force to countries as diverse as Russia, Taiwan, Canada and Indonesia. She said: “We meet families and their friends, perhaps help prepare a homecooked meal, see their special places, and experience the world through local people’s eyes. In May some of our members will travel to two clubs in Texas and New Mexico, USA.” Carol added that the Sunshine Coast club welcomes new members. She can be contacted on 5471 7338, or through the club’s website: www.Friendship ForceSunshineCoast.org.au. aving travelled his road through Scotland’s Grampians as man and boy I, and no doubt many others, perpetually wondered who on earth Jock was. Now with the advent of the internet and Professor Google, I’m informed he was none other than Jock Winter, a local shepherd who in 1887 along with the Scottish Rights of Way Society, successfully challenged the landowner and established Jock’s Road as a Right of Way. Old Mr Winter did us all a favour for Jock’s Road survives to this day as a walking (several have tried cycling) track that follows his droving route from Braemar to the market in Glen Clova. even in these days of GPS, a compass and the ability to use it. This is a summer walk – from late May to perhaps early September. If you’re not an experienced mountaineer wise in the ways of crampons, ropes and ice axes, don‘t even think of attempting this in winter. People have died up here. Getting there: Glen Clova is easily accessible by road from Dundee and Perth and only slightly less so from Edinburgh. You’ll need your own transport. And unless you want to retrace your steps the next day it’s best to arrange to be met at the Glen Doll carpark. without being able to see. Well done Alabama, I guess? 5. DRINK AND DRIVE – COSTA RICA It’s perfectly legal for people driving in Costa Rica to have a pint of beer while they’re out for a casual drive. But it’s an instant jail sentence if you’re caught with more than 0.75% of alcohol in your blood. The simple solution is to avoid drinking and driving. These are just five of the most bizarre driving laws from across the globe. Make sure you don’t fall for any of these when you’re in any of these countries, or else you could be in a spot of bother. THE SWIFT, COMFORTABLE SAFE WAY TO TRAVEL! Norfolk Island Paradise FLIGHTS INCLUDED! *Conditions apply: Prices are inclusive of air & land are per person single share ex BNE in AUD unless otherwise speciﬁed. Prices are correct as at 08 Mar 19 & are subject to change without notice & availability at time of booking. Seasonal surcharges & single supplements apply, & prices may vary due to currency ﬂuctuations & changes to taxes & surcharges. Valid for new bookings only & not combinable with any other offers. Further conditions may apply. Booking, credit card & cancellation fees may apply. Coolum Cruise & Travel ATAS No. A11337. Tewantin Travel ATAS No. A11479. 1. Synonym; 2. Eighth; 3. 180; 4. Defibrillator; 5. .ch; 6. Argentina; 7. Thomas Alva Edison; 8. Bill Clinton; 9. January and February; 10. England or Britain; 11. Five million; 12. Two; 13. Fast food; 14. Northern Territory; 15. Jeff Horn; 16. Perfume; 17. Aunt; 18. May; 19. Three; 20. Six. EVERYONE IS WELCOME TO HAVE A GAME! Largest range display in Queensland!